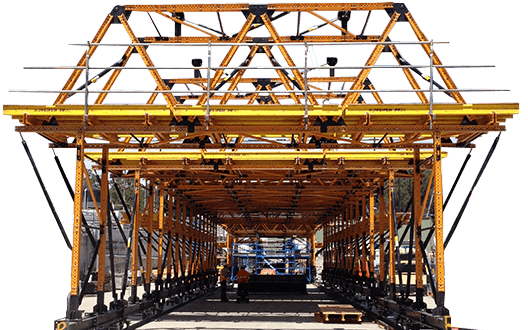 Uni-span Australia designs and engineers, hires and sells formwork systems and solutions for the civil, infrastructure, mining, energy and industrial sectors, both in Australia and internationally. Uni-span is the exclusive Australian and New Zealand distributor of ULMA Formwork Systems. Find out more about the ULMA formwork experience in the video below. Our formwork systems are adaptable and versatile, and can be custom engineered for a wide range of infrastructure projects including tunnels, bridges, roads, towers, above and below ground shafts. Uni-span also has a wide range of labour saving product lines for commercial projects, including decking systems, edge protection, crane assisted or self climbing formwork. Our formwork products also offer market leading concrete finishes. Customers can choose to hire or buy our system components, and work with our trained formwork engineers to develop a purpose-built solution for your project. We provide a seamless engineering and delivery solution for your site. With experienced staff readily available in Brisbane/Gold Coast and Sydney, our team can meet your formwork requirements promptly and efficiently. The Uni-span team will work with you to determine the most effective formwork solution for your project, from the initial design to custom engineering, delivery and onsite supervision and inspection. Uni-span Australia specialises in designing unique and efficient systems that minimise costs without compromising safety. All formwork products are ISO 9001:2015 and OHSAS 18001:2007 accredited, meeting all relevant Australian Standards and codes. Our team can work with you to combine standard components and special formwork systems for your project. Contact us today on 1300 882 825 to discuss your formwork project needs, or submit a quote request/formwork system enquiry.